The long suffering captain and the eldest of the crew. She had a lucrative career as an MP in the United Security Forces before she gave it all up and started doing cross-system deliveries with no questions asked. 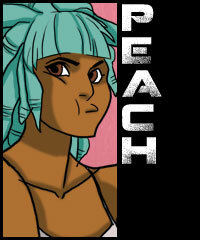 Arguably the second officer- if the crew even had one- Peach is an ex-mercenary with a shady past. 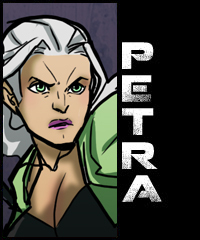 She’s been with Petra since the beginning- and even been her lover off and on. 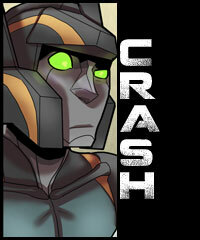 She and Petra serve as the tanks when things go bad, although she most often partners with Crash. 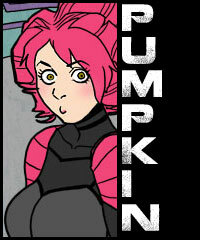 Pumpkin is the ship’s mechanic and engineer. 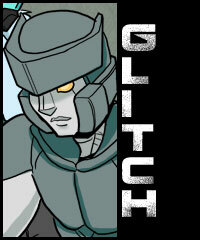 She’s a whiz with engines and putting together worky-bits. She was built by a rogue company strand by DNA strand to be sold for profit. Thankfully a group of well-meaning nuns bought her and raised her. Unfortunately she doesn’t really reflect certain aspects of their morality and decided to take off. 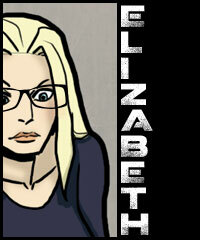 A brilliant doctor and scientist, Elizabeth was the isolated, introverted jewel of Salem Station’s scientific community at only 17. 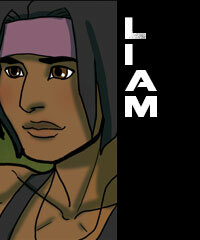 Something went terribly wrong and she found herself marooned on a deserted planet. The crew of the Wild Child found her and took her in, now she serves as both medic and the surprising function of being the team’s sharp shooter. An outer system orphan who bounced around from one USF foster care program to another, Tumi eventually ran afoul of the law. She found herself fitted with a prisoner’s cuff and sent to work off her debt to society in some of the scummiest places a human could find themselves. She’s now the junior mechanic for the Wild Child, much to Pumpkin’s chagrin. While both of them are fantastic at their jobs, Tumi’s specialty is robotics and internal programing. She can’t hack, but she’s pretty good at untangling. Found in dumpster in parts, Glitch had the good luck to catch Pumpkin’s eye. She put him back together again in hopes that he could fill some vacancies in the crew… and in her own personal life. He’s starting to establish his own personality and preferences… as well as cleaning up after people who don’t seem to understand why dish soap exists. Sometimes finding a dessicated alien in an ancient artifact means the end of life as you know it… sometimes it means saving him from the clutches of people with less than your average helping of scruples. 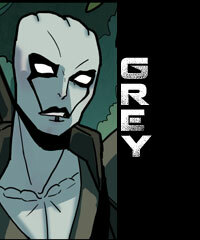 Grey’s a good shot with a weapon for being over a thousand years out of practice and obviously he’s pretty durable. The crew will probably keep him around. As fast as she is pretty, the Wild Child looks to most people like a gigantic hunk of space junk. Connoisseurs and casual observers alike agree that she’s a bit… wonky, and not just because the artist is not so great at drawing ships. Still, she serves her purpose and gets the crew safely from one end of the galaxy to the other- most of the time. 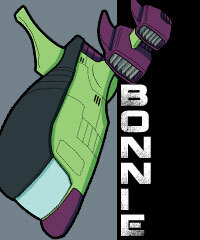 Bonnie is one of two shuttles the crew uses as a runabout. It’s slow, cumbersome, but it’s extremely durable… and large. You can fit a lot of gear in them thar hills. 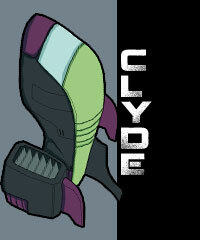 Unlike Bonnie, Clyde is small, fast, and can’t take nearly as much damage. He’ll sit the whole original crew if they squeeze, but there’s not a lot of room for luggage… or guns. 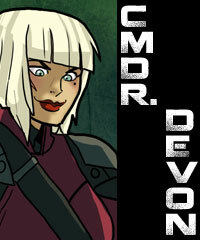 Devon is a commander in the mysterious Vox army. She’s got a pickled human brain buried under layers of silicates and wires. It’s yet to be seen if there’s a pickled human heart or anything else under there. Sin’s like a really pretty, seven foot tall, infectious disease. When he wants to, his can inject nanotech filled venom into other bots through his bite and use the nanotechs to control the victim. He’s at the beck and call of the Vox, but his loyalties lie mostly to himself. USF commando unit who- oh. shoot. Someone scrape him off the floor, would you? Liam’s an okay guy. Just never date him… and never trust him to be anything but Liam. LOVE it! I’m super excited to see more of this comic! 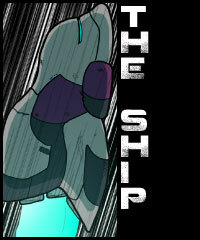 well all ships are a bit phallic in design… but it’s not intentional in any way! I love the concept of this. I have always love space operas, but they are seldom written from a female perspective. You’d never see two female lovers or a woman and a robot lover (and he’s freakin’ hot but I suppose you know that) or female mechanics without being completely sexualize. These chars are are easier for readers to relate to, even we who actually WERE military and are older (ahem) or just girls starting out in life. Its a fun series. Thanks for posting it. I honestly can’t say as I see it….. :s It looks aerodynamic, sleek, symmetrically uniform, and faster than any bat our of hell. Like a good sports car. In the world it’s set in, the ship is an older, unpopular design… so it looks out of date compared to what other people are flying. i’m glad you like it tho! Time to update that wall lineup yes? 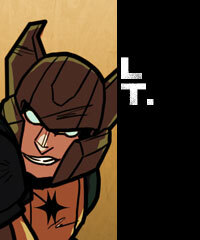 Well, I kind of want to get more pages done- that’s my first priority as far as the comics goes. And my FTP client died and I still haven’t managed to get a replacement. yeah, i kept meaning to and just didn’t have time!